Here are just a few of the hundreds of our 5 star reviews across the web. "Love All Tails...best kennel...amazing staff...dedicated owner and genuine dog lovers. Been boarding here since 2001. Our husky spent weeks at a time at All Tails. We traveled some in July and December and couldn't take our 60 lb. blue eyed long hair husky with us. We never worried because she was loved like a family pet at All Tails. Clean runs, bedding and dishes and lots of attention. She came home healthy and happy. If there was ever a question, we got a phone call. As our overgrown lap dog husky who was "a no,no bad dog, into everything, Marley and Me" beloved family member turned 16 years old and started to show signs of aging, our family adopted a small bundle of fur from All Tails. As our husky grew older (one month shy of 17 years old) and showed significant deterioration in health, it was the owner of All Tails along with the vet who counseled me in our tough decision. Now they love and nurture our 15 lb. little one when I can't travel with her. Little one has specific care instructions, and All Tails accommodates the details and my requests. Our extended family has adopted 3 healthy, gentle and beautiful dogs from All Tails. For the past 14 years, our family has trusted All Tails to care for our furry family members. Thank you , All Tails owner and staff for a comfy, clean doggy retreat." "Fantastic people! Thanks for taking good care of our pup while we were on vacation! We forgot doggy meds when we picked up our Sammy and they drove all the way to us to make sure she had them. Thank you! We strongly recommend All Tails!" "I came here for the first time a few years ago to have my dog boarded while I went on a week vacation. Everything was very easy to coordinate - setting up the reservation, asking questions, etc. The staff is very friendly. I came back from vacation to find my dog in great condition and happy as ever. They do offer grooming services so that when you come back to get them from being boarded, they are freshly groomed too! I then went back a few months ago because I needed my dog groomed but I was not satisfied with the job Petsmart was doing. So I set up the appointment - again, very easy - and brought him in. They asked great questions to determine what I really needed done and I left him there. I got a call in the evening letting me know he was done so I went to get him and they did exactly what I wanted! The groomer(s) did SUCH a great job I didn't need to have him groomed for quite a while. They have a VERY reasonable pricing scale for grooming AND boarding. They are my #1 choice for any of my boarding/grooming needs!!" "This is simply the best boarding facility that we have ever been to. Our dog likes to take advantage of the discounted doggie daycare while he is being boarded. Looking forward to coming here again." " We loves taking our English Bulldog Hoss to All Tails R Waggin'. We started taking him here earlier this year and have completely fallen in love with this place. Hoss gets lots of attention here, and they have recently updated their facility which only makes All Tails R Waggin' more appealing! You're dog will get excellent care from the experienced staff, and their rates can't be beat!" 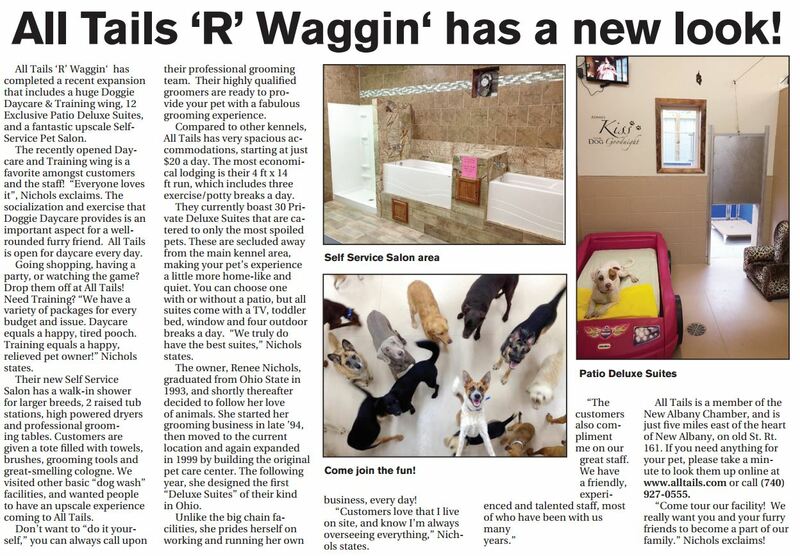 " I have been using All Tails r Waggin for 4 years now. I found their facility through a referral from a friend that has been boarding her dogs for over 10 years from there. With every interaction from this place I have had nothing but professionalism and support. I am one of those overbearing “crazy” animal ladies that hates to leave my animals with anyone other than myself but I have found every staff member there to be trusting. I currently have three dogs. Doodles was an adoption from All Tails actually. They matched him perfectly with my dog Izzy that I was trying to find a mate for. I had also adopted an elderly senior from them with multiple medical problems and during her remaining life on this earth they continued to call to ask about Lady and gave extra care when I did have to kennel her. They even have a vet tech that gave lady her subcutaneous fluids (kidney failure) every day while I went out of town. I have also had my furbabies bathed and nails trimmed from the grooming department. They superceded my expectations for any type of care they have given my animals. I have used them more times than I can count and will continue to use them until all my babies are not longer in this world." "Great Place for all your pet's needs!! – I feel very confident in knowing that my dogs will be very well taken care of when I leave them at All Tails R Waggin! They go above and beyond my dogs needs. Their staff is very professional, knowledgable and very friendly/outgoing. I really love the atmosphere when you walk in and I am ALWAYS greeted with a smile. The size of their runs are outstanding and you can't beat their price!! They have the largest kennels for the lowest price!! I have been beyond pleased with every visit my dogs have had their and they LOVE going their for their doggy vacation! They get so excited when we pull into the parking lot, it's crazy how much they love the place and how much the staff knows and loves them! I will NEVER board or groom my dogs else where!!" "We had the special private suite with outdoor run for our two Bernese Mountain Dogs., who stayed together. We boarded them Saturday through Tuesday, and had both dogs groomed Tuesday morning. I also requested 2 extra 15-minute exercise sessions per dog, per day. "I highly recommend All Tails. This was our first time using them. The facility is extremely clean; it did not smell 'doggy' or like feces/urine. The play area was large, bright, and clean. I noticed the check-in area has security screens where employees can see at all times what is going on in various areas of the facility. Our dogs' pen was clean and well-lit. Both dogs had their photo taken at check-in for security purposes. The staff was very patient with me as i had a lot of questions, being a first-time boarder. They were also very gentle and patient with our dogs as well. When I went to pick up the dogs, each had received a report card that had different aspects of their stay checked off -- behaviors, how well they ate/played/socialized, etc., with personalized comments at the bottom of each. When I came to pick up the dogs, two people from the staff helped me carry our belongings out to the van as well as led one of the dogs for me as I had my hands full with the other one. The grooming job they each received was great. They were so clean and fluffy, brushed out very well and with colorful bandannas. The amount we paid was worth it for four days of outstanding care and peace of mind, knowing our dogs were safe, secure, and treated kindly. I would have no reservations recommending All Tails and will be using them again next month." "Our stay went very well. I was nervous taking my dog anywhere after a very traumatizing for both our dog and us. Renee the owner is onsite and made me feel very comfortable with my dog staying there. They even sent me multiple pictures and videos of my dog socializing with the other dogs. Overall were very satisfied and will go back. I would love to take my dog more often for the daycare/socialization piece, but it's just a bit out of the way. The facility is very nice and clean. I loved that my dog could go to daycare all day so she was worn out when put in her run." 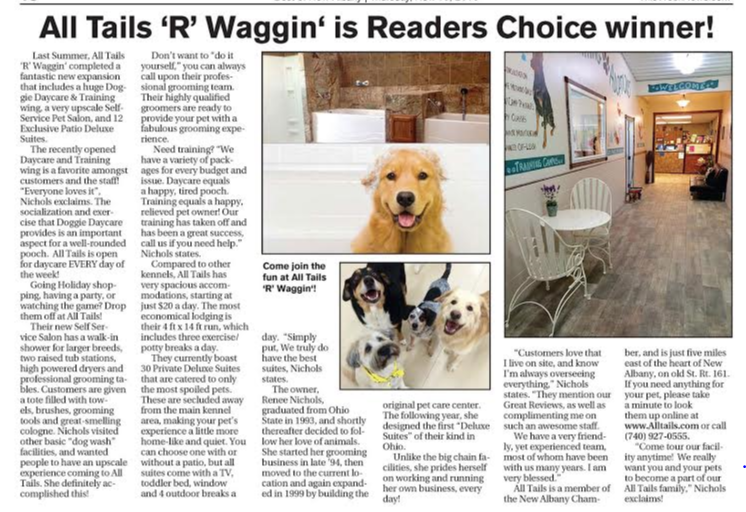 All Tails 'R' Waggin' is Readers Choice Winner! All Tails 'R' Waggin' has a new look!